1. One of the things studying the New Testament will do, is train you to not assume. For example, our culture – even Christians – assume we should honor God and fear what the president will do (or not do). But Peter turns that paradigm on its head and says fear God and honor the Emperor, who was not very honorable. To enter the NT is to enter another world altogether, where assumptions are daily challenged. 2. 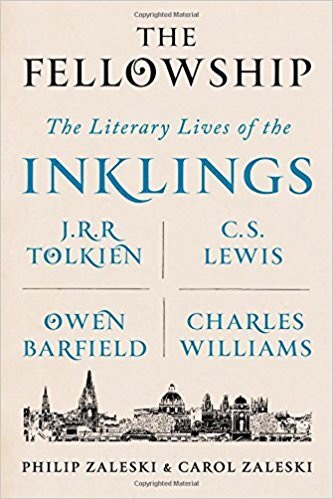 I finished reading The Fellowship: The Literary Lives of the Inklings while on vacation. And it reminded me of when I was young and being so moved by what I read (Beowulf, Sir Gawain and the Green Knight, Canterbury Tales, The Odyssey) in my literature classes that I wanted to tell someone and not really knowing who. I often wonder if those who made all A’s in those classes care about those stories now. Do they still know those first few lines of the prologue of Canterbury Tales in Middle English and carry them around like hoarded treasure? 3. The grace and mercy given to me through the cross saves me from the wrath of God. Also, it saves me from my insecure need to be angry about everything there is to be angry about. 4. How Christians talk about those they disagree with is infinitely more important than what politicians talk about. 5. I have now seen two posts on social media conflating the liberty we have in Christ with our nation’s independence. They are nothing alike. And for those who follow Christ, one of those freedoms is so treasured, the other is but a wistful rumor. 6. The difference between a very crowded beach and one that is not, makes all the difference. The beauty is obscured by the amount of commotion. But first thing in the morning? When no one is out there? Magic. 7. I have this theory: If you talk about a relational problem between two people (or two groups of people) too much, you actually do more harm than good. I think it’s a fairly sound theory for a couple reasons. First, generally the talk involves and naturally tends toward offenses and hurts. And the law will eventually push one party away. And second, I believe there is grace in silence. This stands in opposition to modern thinking that does not believe you can talk about anything too much. 8. I miss sitting out on the balcony in the morning with Bethany, looking out over the Gulf, eating half a biscuit and sausage topped with pimento cheese and a fried egg. 9. There are many moments in Dante’s Inferno where my breath is taken away. And then there are other times where I’m glad there are notes and commentary for my second reading. 10. There is always more grace and mercy enjoyed, than we can see. Good stuff here. Esp #7 – I’ve seen this dynamic happen. As they say in the theater “less is more.” Sometimes the best way to handle a problem is to talk less about the problem and fix our eyes on something better. Can you expound on #7? Trying to reconcile w/my brother…and the silence of grace hasn’t really worked. It’s a conversation that needs to happen but he’s blowing me off — for 2 months now…and he doesn’t even really know why I want to connect. Thoughts? I think that the path to reconciliation is often a path of not talking about reconciliation but other things. It would take a hole post to lay out the theory in detail. But often talking about the problem between two people is part of the problem between those two people. This is not always the case, however. Also, what will work is not always something we can lay hold of. Sometimes, nothing will “work.” Not silence or speaking. Tracking with you on this, thanks. Pretty sure nothing will work, yet knowing that I have to attempt in order to set myself free from the ‘silence’ because, again, pretty sure there will continue to be ‘silence’–no expectations on my part, certainly, hope, yes. God takes it from there. Psalm 25 helped this morning–esp v.20 guard my soul..but it all was a comfort under my present issue.